with the teen halfway through her junior year of high school, we've been talking quite a bit about what she might want to do after graduation. she's always known that both her dad and i expect her to continue her education after high school - it's the one thing we've always agreed on. she was recently invited to participate in the fashion spread in the yearbook, which is awesome. she has a fabulous sense of style and loves to put together ensembles that work really well on her, and it caught the attention of someone on the yearbook committee. they had the photo shoot a couple of months ago, and i'm excited to see the finished product at the end of the year. 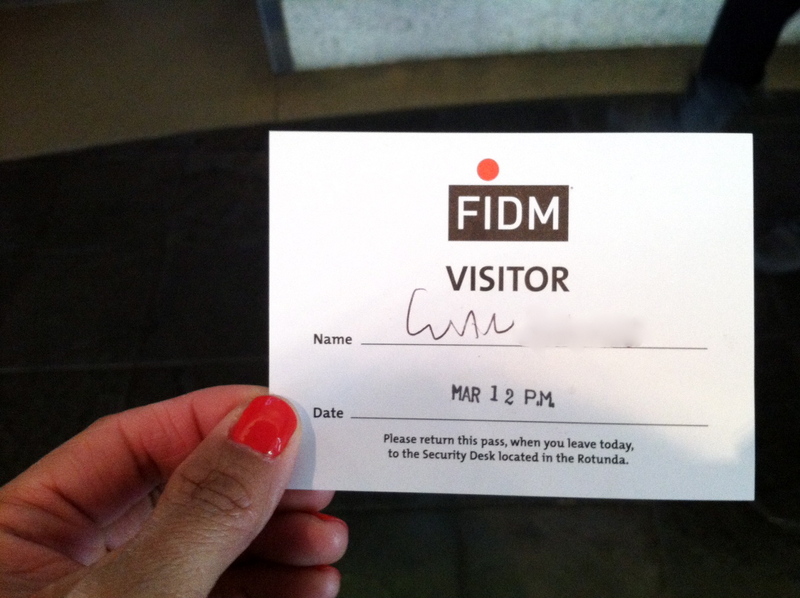 and then a rep from FIDM came to her art class and piqued her interest. she seemed to be pretty excited at the idea of pursuing a career in the fashion industry one day, and so the hub and i encouraged her to reach out to the school and see if we could meet with an admissions rep and schedule a tour. so she did. the bean fell asleep in the car on the way, so the hub dropped us off in front of the school and went off on a driving tour of downtown l.a.
i would've liked to check this out too, but it wouldn't have been cool to leave the hub circling the streets while we took our sweet time in the museum. we'll just have to come back before the exhibit ends. we got our visitor passes and made our way upstairs to check in for our appointment. the teen was given a questionnaire to fill out while i sat back and surveyed our surroundings. the admissions rep was really nice and gave us some great information on the school, asked the teen a bunch of questions to narrow down what her major might be, and offered some fantastic feedback on her transcripts. this was something i'd been a little worried about, because her GPA could be a bit better and i was afraid it would keep her from getting into college. it was great to find out that FIDM relies not only on transcripts from high school but on the package and project that's submitted at application time. she offered unlimited assistance in making sure the package was absolutely perfect, which would help considerably in the process of being admitted. students at the school are solely responsible for producing this magazine twice a year. and i was excited when the teen pointed out a little stella & dot on one of the pages. based on the answers to a few simple questions, our rep zeroed in on the perfect major for her - merchandise marketing - which could lead to all sorts of different things both during school and afterwards. oh, so exciting! i'm just so thrilled for her. on the tour, we learned that monique lhuillier and the co-creator of juicy couture, as well as scores of other fashion industry icons are FIDM grads. i totally thought of my friend 10years as we admired this display. there are some cool study areas in the standard oil building, just across the street. it was a gorgeous day to be outside. graduations are held at staples center, and the students get to decorate their caps in their own unique style. armed with a stack of paperwork, the application packet, school catalog, and copies of the last two student magazines, we headed off to check out the bookstore. i thought it would be fun for her to have a shirt or something to wear that would remind her of the tour and motivate her to work towards completing that packet and project for admission. i didn't buy one for myself, but i sure found the one i would've chosen if i had. i loved the "FIDM mom," "FIDM dad," and "FIDM sister" tees they offered as well. and on the way home, we passed by the setup for the premier of the "hunger games" movie. ooh, i can't wait to see it. i would've loved to stop and lookyloo, but i could tell the hub wasn't all about it. oh, well. are any of you FIDM students/alumni? or do you know of anyone who is? we'd love to hear from you. i want to do whatever i can to keep the teen excited and motivated, and i think it would be fun to hear some feedback from someone who's been where she's gonna go. i'm not gonna lie, the more the rep talked about the programs available and the different kinds of careers that FIDM students go on to have was really inspiring. as much as i hate school, i kind of wished i'd known of all this when i left high school. things for me might have been drastically different, and almost definitely more satisfying career-wise. sometimes i wish i could go back in time and change things like this. and then again, who knows where i'd be today? my life is pretty awesome as it is. but for the teen! the world is full of possibilities for her, and i just can't wait to see what life has in store. that is one bright future she's got ahead of her. i can feel it. my best friend is a FIDM graduate in merch marketing! she now works for gap, inc.
FIDM is a great school! I toyed with going there for a brief time to major in Fashion Merchandising and I loved it when I went on the tour! She should check out DesignLoveFest.com. This girl, Bri, is so inspiring and full of advice. She's a FIDM alum and works as a freelance graphic designer. She's been able to build her business and it has lead to wonderful things for her (Rue Magazine, BlogShop and a collab with GAP). She's even got me re-thinking my career path....the way I see it, it's never too late. My cousin went to FIDM, not for merchandise marketing though, but as a designer. He worked for a number of years in various companies before going back to college. He got better jobs after that and some acclaim (Google Phong Hong), but it's still a really tough business. Totally different environment for designers vs. marketers though. If she doesn't get into FIDM, I remember Mt. SAC had some fashion merchandising classes a while back. I'm not if it still does, or if there's a whole program, but something to look into. I'm an honorary grad for living next door for 10 years.